Canadians take a break in a captured German trench during the Battle of Hill 70 in August 1917. They call it “Know by Doing” and it certainly is not your grandparents’ history class. There are no textbooks to be seen. There is no one speaking from the front of the classroom because there is no front. At computers and tables the students teach themselves, tracking down original evidence, studying period maps and examining military records. All in order to better understand what happened more than a century ago near a small town in northern France. If they were of drinking age, they could even study a craft beer being produced a block or so away in this Eastern Ontario town. Hill 70 Belgium Blonde Ale, the latest product from 4 Degrees Brewing Co., is being billed as “Sir Arthur Currie’s Choice,” although at 7-per-cent alcohol it might be a tad strong for the man who led the Canadian Corps in the Great War. A huge, imposing figure at 6 foot 2 and 250 pounds, Lieutenant-General Currie suffered badly from stomach ulcers. Aug. 15, 1917, Canadian attack to capture Hill 70 opened with a massive artillery barrage. German troops counter-attacked no less than 21 times over 10 days. Each time they met a wall of Canadian bullets and shells. The large German force was pinned down in defence of the town of Lens. When the major fighting ended Aug. 25, 1917 Canadian [casualties] numbered 10,000 but the Germans were dislodged and the city of Lens was in Allied hands. Unfortunately, the Battle of Hill 70 is one of Canada’s forgotten battles. The history students at Smiths Falls District Collegiate Institute begin with these simple facts and create their own story of Hill 70 as would have been experienced by the individual soldiers they choose to examine. Once the students have assembled as much information as can be found on their chosen soldier, they then attempt to track down living relatives in the hopes that they might exchange their research for photographs or letters home that the families might have kept. Located families are invariably delighted to make the trade. Student Hayden Merkley, left, and Seth Philion, centre, help Grade 10 student Jeremy Wright with his research by reading the wary diary of a First World War soldier during their history class at Smiths Falls District Collegiate Institute on Oct. 25, 2018. That will be something new for those who fought in this very Canadian battle that somehow fell out of much national awareness. Yet today, the battle is increasingly being regarded as being pivotal in the birth of Canada as a nation onto its own. While the Battle of Vimy Ridge (April 9-12, 1917) is most often referenced as both a significant turning point in the war and the beginning of Canadian independence, it was only at Hill 70, four months later, that the Canadian Corps came under full Canadian command for the first time. It came at a heavy cost – 1,877 Canadian soldiers lost their lives in the fight – but it solidified the reputation of Canadian soldiers and officers as effective and innovative fighters. Where other Allied troops had failed, the Canadians under Currie’s command succeeded. 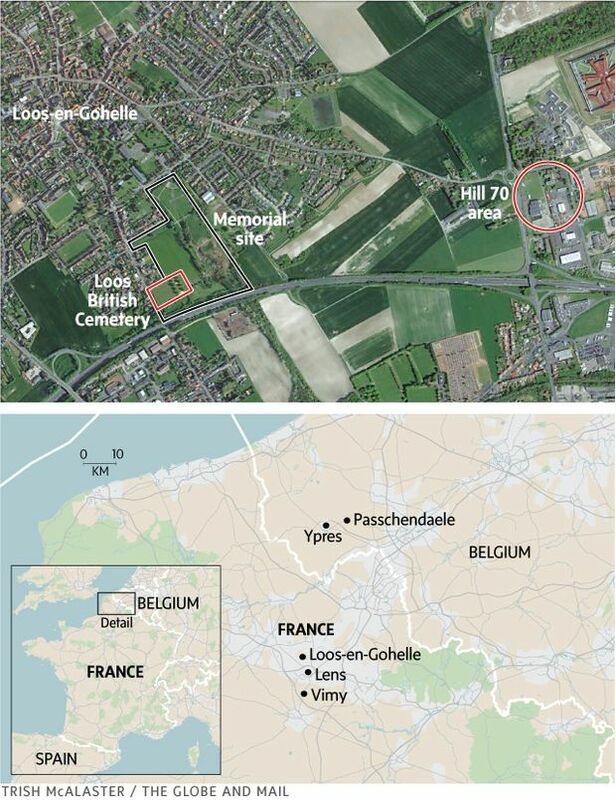 They took the hill and, despite multiple counterattacks, were able to contain German forces in the nearby city of Lens. “The perception of Canada was really fundamentally changed by Arthur Currie,” says Chris Hadfield, the Canadian astronaut whose great-grandfather and great-great uncle fought at Hill 70, the uncle later losing his life at Passchendaele. “For us to be able to stand up and do something on our own, where we are responsible for our own actions, where we are going to risk just our own lives to do something that is important to us as a nation – then that’s what Hill 70 was. Lieutenant-General Arthur Currie in April, 1917. The project, in conjunction with the Gregg Centre at the University of New Brunswick, has helped several of the Smiths Falls students get to France to see firsthand the memorial and nearby cemeteries. Chantal Séguin teaches the history class at Smiths Falls District Collegiate Institute, where students research the soldiers from the First World War and the Battle of Hill 70, on Oct. 25, 2018. One tool that is helping the students appreciate the reality of war is the graphic novel. So far, Rob Engen (author) and Matt Barrett (illustrator) have produced two, one on Brock Chisholm, who received the Military Cross for his bravery at Hill 70, and one that tells the unique story of Frederick Lee, a Chinese-Canadian who died at Hill 70 fighting for his family’s new country. Over at 4 Degrees Brewing, operations manager Jeff Murphy pours a glass of Hill 70 beer, Sir Arthur Currie’s Choice. A portion of each pint sold will go to the memorial project. There are plans to include a QR code on labels so that those with smartphones can learn about individual soldiers who fought and died there. 4 Degrees Brewing Co.'s Hill 70, dubbed Sir Arthur Currie's Choice, is seen in Smiths Falls, Ont. A portion of each pint sold will go to the Hill 70 Memorial Project.